mainly used in operations in difficult terrain and in adverse weather conditions in the mountains of Switzerland. Especially for winter driving were the other emergency vehicles could not be used. 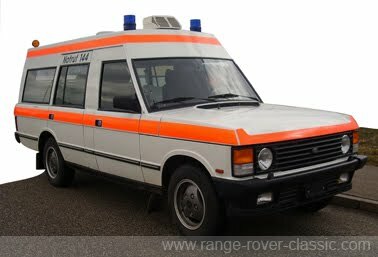 Still today this Range Rover ambulance is in active service, ie Zürich. 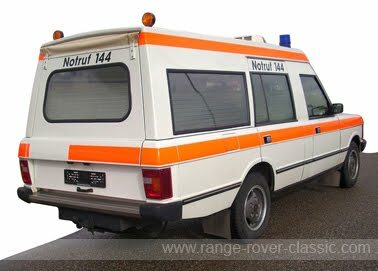 The Emil Frey converted Range Rover ambulances were produced from approximately 1984 and through 1993/94 and were mainly used in Switzerland. The ambulance had standard front doors and used a body extension between front and rear door. shut line at the rear wheel arches. The body was also lengthened behind the rear wheels. Emty weight: 2400 kg and 300 kg load capacity. Seating for 4 and 1 stretcher. The spare wheel was stoved in a special carrier under the rear end of the floor/fuel tank. Roof and the rear side doors were also heightened for better space. This Range Rover had one single piece top hinged rear door.